The exterior of Newfields, The Indianapolis Museum of Art. Photo courtesy of Doug Roche III. Everyone needs to escape the clutches of campus from time to time. A change of scenery can ignite a creative spark, can free yourself from time-consuming writer’s block or simply give you something to do when you have time to kill. Newfields is a spot that has grown on me the more time I have spent at Butler and in Indianapolis. The Indianapolis Museum of Art is an amalgamation of more than five millennia of art and artifacts. It’s no Museo del Prado or Louvre, but the works at the IMA can create an entire day’s worth of exploring and searching for inspiration behind your next creative endeavour or opinion article. Preparing for finals week and putting the finishing touches on any final assignments may limit your time to get away from Butler, but Newfields is a geographically favorable and timely option. Here is your mapped-out visit to the four floors of Newfields, where all Butler students can join for free upon their first visit. Floor One: 87th Annual Juried Exhibition of Indiana Artists, Inc. Representing the artists residing in Indiana, The 102-year-old organization Indiana Artists is made up of more than 150 professional artists across the state. Until June 1, Newfields will hold over 40 works ranging between paint, watercolor, photography, sculpture, textiles and drawings. The organizations hosts three exhibitions annually, as well as lectures and workshops throughout the year for those of you concerned about getting a favorable grade in your PCA. I had no prior knowledge of prominent Indiana artists, but I was especially impressed by their ability to make straightforward subjects and settings convey intimacy. The artists I most appreciated did so through their execution. Steve Warner’s “Across the Room” is a piece that brilliantly captures being in a mostly-empty restaurant in between meals, while a party you spend a few seconds observing sits at a booth across the dining room from you. You try to dissect their dynamic, where they were before this, where they were 10 years ago, all while contemplating how obvious your eavesdropping is to them. “Coming Storm” from Martha R. Nahrwold is a distorted, borderline surreal look at an open country road that winds off the canvas, seemingly avoiding the looming storm clouds beyond the trees and field of grass. Ellen Lyon’s “Who Looks at You this Way?” is vibrant and attentive to detail in the ripples and reflections coming from the subject afloat in his backyard pool. It’s so precise, you may be convinced there is a sun beyond the canvas that is radiating his world. You will long for the dog days of summer you spend by the lake or pool. Throughout 2019, Newfields is offering several exhibits celebrating various types of Japanese art. The pop-up tea house overlooking the first floor lobby is your escape from the traditional cafe food offered at the IMA. The affordable and wide-ranging selection of food and beverages that reflect Japanese culinary arts is admirable. 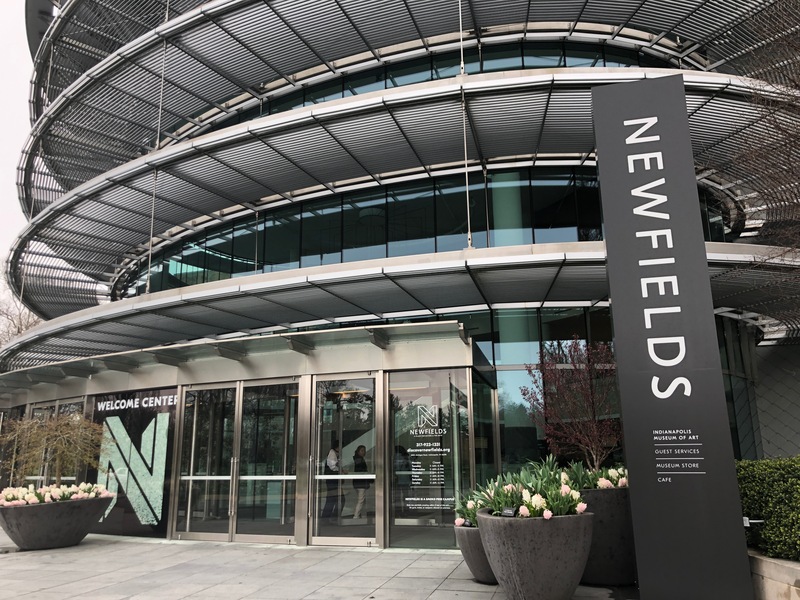 Certainly a transporting experience that primes you for the rest of the Newfields’ Japanese-focused exhibits, which next sees the arrival of a contemporary fashion exhibit at the end of the month. From April 28 to Jan. 5, 2020, the new exhibit will analyze the designs from 1980s Japanese designers that challenged western beauty standards. Until then, the museum is hosting an exhibit based on a painting by Tosa Mitsunari, which offers an interactive landscape that displays the life, sounds and seasons of Japan. Mitsunari’s 17th-century painting is based off the “Poems for the Twelve Months” from 12th-century poet Fujiwara Teika. Two artistic mediums over 500 years apart from each other are coalesced through Japanese-made projectors. This might have been the closest I have ever come to finally booking the impulse trip to Japan I’ve dreamed about for years. One thing we discussed in my consumer insights class is our generation’s “analogous upbringing,” which contrasts our “digital thereafter.” This relatively bleak idea creates a sense of nostalgia and gives me an appreciation when I consider modern art. Several works in the exhibit depict regular people engaging in everyday life. While this sounds straightforward and plain, it made me consider the digital transportation we frequent on mobile devices and screens — as unique as it was, the Seasons of Japan exhibit is a perfect example of this digital reliance. I was surprised to see a 1926 painting from renowned American artist Norman Rockwell. Rockwell’s “The Love Song” — the exhibit’s most thematically resonant piece — portrays two elderly men playing flute and clarinet, while a young lady pauses her sweeping to listen. The title is indicative of her infatuation with what her ear hears, but what the music actually conveys to her is ambiguous and leaves the viewer crafting the love song in their own head. Floor Four: Deconstructing the American power structure, literally. The fourth floor holds a sociopolitical-focused exhibit from Indiana native Samuel Levi Jones titled “Left of Center.” The exhibit comments on the oppression induced by American power structures. Presented through paintings and sculptures made from deconstructed medical and law books, encyclopedias and football equipment, the exhibit touches specifically on the disadvantages that black people face in the country’s criminal justice system and healthcare, as well as their underrepresentation in American history. The exhibit’s core is a collection of photos titled “48 Portraits (Underexposed).” The use of “underexposed” in the title has dual meaning: the low levels of light exposure in each photo, as well as an allusion to the state of African-American life in America. It includes 48 portraits of African-American figures at a low exposure, which represents the casting out, silencing, or blatant disregard of the African-American community’s cultural impact and merits.